Email your questions to admin@lotussp.com and we will email you back when we have posted an answer. What is DRG (Dorsal Root Ganglion) stimulation? 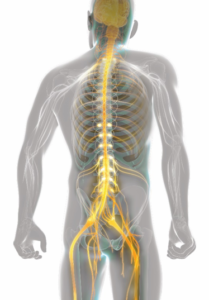 Dorsal root ganglion stimulation is a brand-new FDA approved therapy for treatment of chronic pain. The dorsal root ganglion is a cluster of nerves which can generate pain. 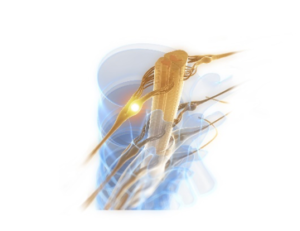 The DRG stimulation procedure specifically targets these nerves to block the pain. It can precisely target the hard to reach nerves that may cause nerve pain in the legs and feet. Are there studies to evaluate effectiveness? One year long study of DRG stimulation (1) showed that patients with DRG stimulation had significant decrease in pain as compared to those patients who had spinal cord stimulators (74% vs. 53%). Also, patients with DRG stimulation had less side effects of nerve tingling as compared to those with spinal cord stimulators (95% vs. 61%). What are the benefits of DRG stimulation? As the opioid crisis in our country grows, there is a need for alternative treatments for chronic pain. The Neuromodulation Appropriateness Consensus Committee (NACC) reported in 2013 that patients who had neurostimulation were less likely to need opioid medications. DRG stimulation is a breakthrough therapy that can block pain signals and prevent the need for stronger oral pain medications. The procedure for inserting DRG stimulation device is considered minimally invasive. Electrodes are implanted directly on the nerve cluster (DRG). A stimulation device is also implanted, it is like a “pacemaker for the nerves”. 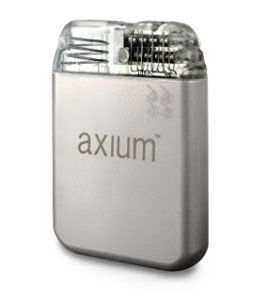 At Lotus Spine and Pain, we use the Axium Neurostimulator system which simulates the dorsal root ganglion with precise anatomical targeting. The device is powered by batteries and is programmable. As with any procedure there may be certain risks, and this may not be the right treatment for all patients. If you have refractory or chronic pain, please discuss with your doctor or contact us today to see if this is the right treatment for you. You have probably heard about the opioid epidemic which is affecting millions of people throughout the United States. According to the CDC from 1999 to 2016, more than 630,000 people have died from a drug overdose (1). This is a very serious problem and at Lotus Spine and Pain we care about our community and are fighting against the opioid epidemic in San Antonio. An estimated 11% of adults experience severe pain daily (2), and millions of Americans are treated with prescription opioids for chronic pain, without trying any alternatives first. Improving the ways we treat pain and patient education is key. At Lotus Spine and Pain, we offer alternative approaches; and because of the quality and effectiveness of our interventional program, many patients receive early and effective pain control and do not need opioid pain medications. Our doctors are Board Certified and offer comprehensive care. To find out more please call us today. When should I see a doctor about my back pain? Back pain is a very common condition with more than 75% of US adults experiencing at some point in their lives. About 90% of those with new onset of back pain improved within 4-6 weeks. Oftentimes no specific therapy is required, as the pain will improve on its own. However there are several red flags that should require to seek medical attention. Any new weakness, numbness, loss of bowel or bladder control should prompt evaluation from a physician, and likely imaging will be obtained. There were many causes of low back pain. When the pain is isolated and low back it may be a muscular strain, pain associated with the joints of the spine (facet joints), or may even be from disc degeneration. However when pain is going down the leg it is often do to compression of a nerve root, usually from a bulging disc. Should I get an injection for my neck or back pain? 90% of back pain will get better on its own within 4-6 weeks. Weight loss and specific stretches and core strengthening exercises are usually very helpful, and should be the first step. If the pain persists, and is causing a significant restriction to your daily activities ( ability to work, or ability to just enjoy life) then you may want to consider a procedure to help with her pain. Additionally, if you are requiring medication to help manage your pain, a procedure may help reduce or eliminate your need for medication. Our bodies make natural steroids, from adrenal glands mostly, that provide a variety of functions in our bodies including maintaining our blood pressure. Repeated steroids into joints may cause degeneration of the cartilage and repeated steroids into muscle may cause weakness of that muscle. Thankfully there are now many more options other than steroids that may help improve the healing process, and decrease inflammation without the harmful side effects of steroids. Radiofrequency ablation is a technique that desensitizes painful joints of your spine. This can be used for neck, mid back, low back pain, as well as sacroiliac joint, knee joint, and hip joint pain. The first step is to identify the painful joint by doing an x-ray guided procedure. For the neck and back this is called a medial branch block. Depending on your pain relief from this procedure, you may be a candidate for radiofrequency ablation in which the painful joint would be desensitized for approximately 1 year.